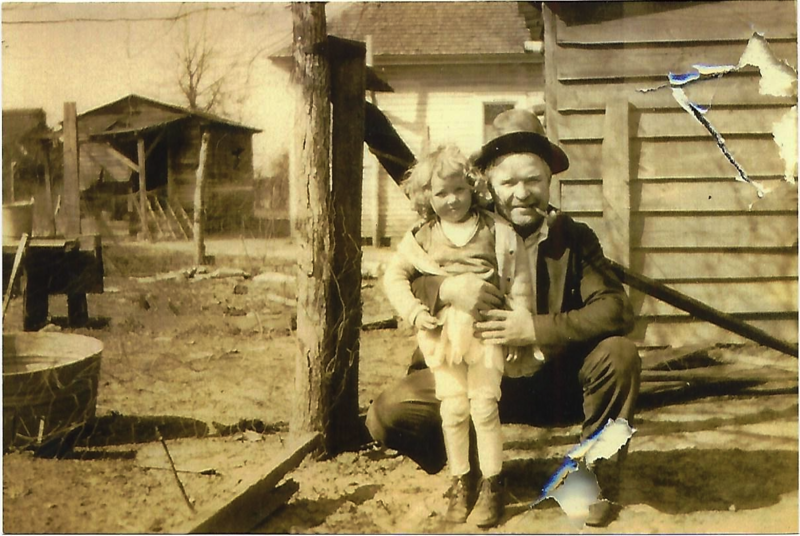 Eloise M. Randall with her father, Henry Beaman Randall. Circa 1930. Daughter of Henry Beaman Randall and Muriel Willene “Willie” Maret, Eloise M. Randall was born Sept. 4, 1925 in Lavonia (Franklin County), Georgia. By 1940 (according to the 1940 U.S. Census), Eloise M. Randall had moved with family to Wayne, MI (near Detroit, MI). There, she lived with her family - along with her 81 year old grandfather, Joseph W. Maret. The Randall family rented a house at: 157 Grove Avenue, Highland Park, Wayne, Michigan. In 1940, her father, Henry Beaman Randall (then age 49) was working in the Automobile Industry (at Ford Motor Co.) as a Crank Trimmer. Her brother, Floyd H. Randall (then age 19), also worked in the Automobile Industry (at Ford Motor Co.) as an “Inspector”. After graduating from Highland Park High School in 1943, Eloise also began working for Ford Motor Co.
Eloise loved to roller skate and she met her future husband Dale J. Rottman (born Oct. 26, 1924) at the Highland Park Skating Rink, as Dale was in the U.S. Navy stationed there. On January 25, 1945, Eloise M. Randall (at age 19) married Dale J. Rottman (age 20) at the “Trinity Lutheran Church” in Laramie, WY. With Dale still serving in the Navy, they moved to San Francisco following his transfer. After Dale was discharged in 1945 they moved to Laramie, where they both worked on a ranch west of Laramie and Dale also began to work for Union Pacific Railroad. Dale was recalled into the military for the Korean Conflict, so Eloise moved to Detroit to live with her mother. Following Dale's discharge the family moved back to Laramie, where Dale continued to work for the Union Pacific Railroad. Eloise Rottman, 89, of Laramie, passed away Sunday, November 9, 2014 at her home. She was born in Lavonia, Georgia September 4, 1925 the daughter of Henry B. and Muriel Willie (Maret) Randall. While she was young the family left Georgia and moved to Detroit, MI where she graduated from Highland Park High School in 1943. After graduating from high school she began working for Ford Motor Co.
Eloise loved to roller skate and she met her future husband Dale at the Highland Park Skating Rink, as Dale was in the U.S. Navy stationed there. They were married at the Trinity Lutheran Church in Laramie January 25, 1945. With Dale still serving in the Navy, they moved to San Francisco following his transfer. After Dale was discharged in 1945 they moved to Laramie, where they both worked on a ranch west of Laramie and Dale also began to work for Union Pacific Railroad. Besides being a proud homemaker for her family, Eloise worked a variety of jobs while her children were growing up. She was always supportive of the activities her sons were in and became a member of the PTA. Eloise was also active in numerous organizations including Women’s Auxiliary of VFW Post 2221, Hospital Auxiliary, Laramie Plains Museum, Women’s Club, and Senior Swimming, often picking up others to go with her. She was very active in the Trinity Lutheran Church activities such as arranging receptions at the church, and being a part of the quilters group. Dale and Eloise shared a love of UW Basketball, holding season tickets for many years. Eloise is preceded in death by her husband, Dale; her parents; three brothers and a sister. She is survived by her sons, Tom Rottman and his wife Janet, Roger Rottman and his wife, Cindy, all of Laramie, WY. Her grandchildren, Jamie Summers, of Laramie, WY. Kimberly Bohannon and her husband, Zach, of El Paso, Texas, her four great grandchildren, Alex, Jacob, Cheyenne and Cody. She is also survived by numerous nieces and nephews.